Ten pence by Karl Baron is licensed under a Creative Commons Attribution 4.0 International License. Abby found the ten pence coin in the street. She had gone outside to play on her mother’s orders. “Screen time’s up – out you go,” her mother had said. Reluctantly Abby turned off reruns of “I Love Lucy” and got on her jacket, then went outside to sit on the front steps. It was a small coin, the ten pence. She might never have seen it if the crowned lion on the face hadn’t growled. Yes, growled. At first she didn’t recognize the sound; was it a bit of machinery from around the corner? But no, the sound was definitely coming from the street in front of her. Was it something below the street, then? She got up and went to the curb to look. There was no traffic, it was a quiet Friday afternoon – Veteran’s Day, so she’d gotten the day off of school – and besides, on their small cul-de-sac they didn’t get many cars except the neighbors’. Abby’s mom did at-home payroll for an IT company, and she didn’t like Abby hanging around inside the house, much as Abby loved to curl up in the big chair in the living room and read when she wasn’t watching old TV shows on TiVO. Abby had gotten used to poking around outside for things to do, although it didn’t make her enjoy time being outside any better. Just because you’re used to a thing doesn’t mean you get any pleasure out of it. It didn’t help that it was November in Seattle, a time after the end of Daylight Saving Time, when it got dark at five in the afternoon and most days were gray and dreary. But this day was unseasonably sunny and even a little warmer than usual. At the curb Abby looked down, and right there on the dark pavement, nestled next to the iron-cast storm drain with its painted fish logo (“This drain goes straight to Puget Sound”), was the coin. Looking closer, she could make out the stamped outline of the lion, paws akimbo, crown on its head. What was that rhyme? “Find a penny, pick it up – all the day you’ll have good luck.” The verse ran through her head as she crouched down. Well. This wasn’t a penny. But it was something. Was it real? Maybe it was play money. Then she remembered the growling she’d heard. Had she imagined it? There was not a sound now, not a peep. Make a wish. She should make a wish. It was a little tarnished. One edge had a dent, as if it had been run over or caught in a clencher like a vise. 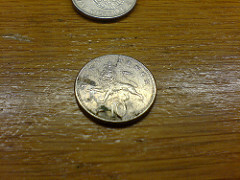 If the coin was once lucky, had the luck been bent out of it by its prior collisions with everyday life? Perhaps as a coin wore out it became less lucky. Or perhaps the opposite was true – the more marks and blemishes, the better. She thought of the story of Aladdin’s lamp and how old and battered the lamp looked, leading Aladdin’s wife to give it away to the villainous lamp collector-magician. . . . or maybe that was Ali Baba with the lamp? No, definitely Aladdin. Abby closed her hand around the coin and felt its cool steeliness smooth her palm. Lucky or no, it was a treasure, a ten pence coin that had turned up in front of her house. A ten pence coin that had growled at her, no less! She was positive of that. But what would she wish for? Like Aladdin, she felt stymied by the possibilities. A million dollars. A new house. A pony. – Didn’t every girl her age want a pony? Well, no, not a pony – a horse. A brilliantly fast chestnut mare, who would run to Abby when she called and take her anywhere she wanted. Who would love her as much as Abby loved the horse. That was ridiculous. As her mother said every time Abby brought it up, “Where would we put a horse? You don’t keep an animal like that in suburbia!” And Abby would imagine the horse, her horse, in their back yard under the chinaberry tree, and she knew her mother was right. Her back yard was no place for a horse. Huh. Abby walked slowly back to the front porch. She sat down on the steps, still holding the coin tucked inside her fist. She had to think about this. Well, a wish was as good as a prayer. Her grandmother was always asking Abby to pray for everyone who needed it – those who were sick, those who had lost loved ones, those who had had some family tragedy. Her mother would say that her grandmother had a taste for drama. It was probably a good thing that her grandmother was back in Michigan and her mother and Abby were out here in Washington. A wish was as good as a prayer. Abby decided to close her eyes and make that wish. She would wish for what she really wanted, what she truly sincerely wanted, not just something that everyone thought you should wish for. When she opened her eyes, nothing had happened. It was perhaps a little later in the day, the sun turning paler and the light coming across the yard next door. But the coin had disappeared. Years later Abby would think about that coin, would wonder idly where it might have gone next. When she got old enough she moved to Colorado and took a degree in horse management, and then afterward she found a job with a ranching co-op near Fairplay. Her horse, a chestnut mare that ran brilliantly fast and came to Abby when she called her, was named Lyric. I love it! Such a wonderful story. You write such terrific stories! Oh, I have never been on a horse. One day, I’ll give it a try and ride a beauty, even if she only walks.